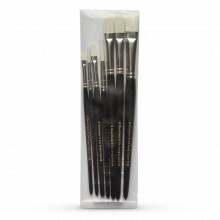 Made of hog bristle, this brush is traditionally used in oil painting. The white Chinese bristle from Chungking is of the highest quality. Its natural hardness responds perfectly to more or less dense oil painting technique and acrylic.